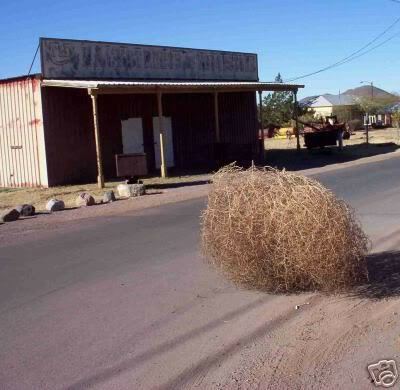 In visual media the tumbleweed is often associated with Western film. They often represent areas that are desolate, dry and often humorless, with few people. Sons of the Pioneers also describe them as lonely plants. “Tumbleweeds around me sing their lonely song,” they sung. Although they have become symbols of desolate they can be found almost any were. They can grow on dry plans, in fields and on roadsides. They live on flat open areas where the wind can blow them around. They don’t start as weeds that just blow around, however. They start out as a plant in the soil. They grow to be about three feet and when matured they break off from the base. They are rounded allowing it to blow around in the wind. The natural purpose the tumbleweed blowing in the wind is to release seeds. They can produce up to 250,000 seeds, and they tumble to spread the seeds. Now they tumble around in America and represent the wild west of American, but they weren’t always here. They came from Russia carried by farmers who didn’t know they were bringing the seeds over.